The Moroccan-born Norway international joins the Saints from FC Basel, and it may mean Shane Long will need to move on. 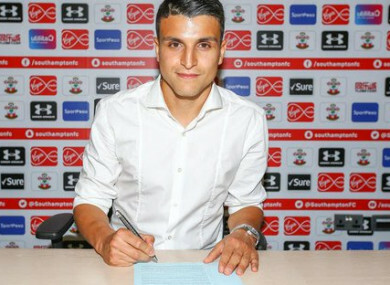 SOUTHAMPTON HAVE SIGNED Norway forward Mohamed Elyounoussi from Swiss club Basel in a deal worth a reported £16 million (€18m). Elyounoussi, who has 16 caps for Norway, is Southampton’s second close-season signing after their swoop for Celtic’s Scotland midfielder Stuart Armstrong. It could spell the end of Shane Long’s time at the club as the Ireland international found starting berths hard to come by last season. “Following on from the arrival of Stuart Armstrong this week, we feel we have made real progress in adding a new dimension to our attack ahead of the season,” Hughes added. Southampton finished 17th in the Premier League last season, narrowly avoiding relegation after the arrival of Hughes, who was sacked by Stoke in January. “The club have been following me for a long time, so I feel really confident to come here and to get even better and develop myself,” Elyounoussi said. “I’m a hard worker on the pitch and I like to create chances. That’s where I’m at my best, when I can use my creativity. Email “Southampton capture €18m striker Elyounoussi as second summer signing ”. Feedback on “Southampton capture €18m striker Elyounoussi as second summer signing ”.